Kung Fu Monkey: LEVERAGE Facebook page is live. LEVERAGE Facebook page is live. Maintained by the Charming Network Overlords, will be the source of LEVERAGE-y goodness. Photos on the site are primarily from the first shot episode, but mid-season air date: "The Bank Shot Job". Written by stalker-boy favorite Amy Berg. Saw the Leverage trailer today at the matinee. It looked so much more interesting than everything else being pimped in the preshow. Congratulations to all involved, I can't wait to become a loyal viewer. They're running it in theaters? Damn, what movie? Anyone on the north side of the boarder picked it up yet? I'm looking forward to this turning up over here in the UK at some point (or resorting to DVD if it doesn't). Just one little thing that struck on the official web site: the main heading on the front page reads "The con is on" which is the tag line for the BBC show "Hustle". Sweet! My folks are looking forward to seeing it. P.S. you need to call or e-mail me or the kitten dies. 1) Facefrikkinbook?!! No no no!!! 2) WTF: Con is On in DECEMBER?! Does this mean the debut has been pushed back two months (was October!)?! Enlighten us, He Who Leverages! Are they also doing a Myspace page? Because I'd add it in a heartbeat! That dress is surplus from the En Vogue video "My Lovin'." As the Prophet D said, "Bring the NOIZE!" Dang— I saw something that looked remarkably like a Leverage trailer before Batman way back when … like, a week after it came out. You know the one: "We're all here to be told we're not going to be paid? Hmmm …"
It made "the Twenty" bearable. Probably because it was shown near the end of it, and I'd just gotten seated. 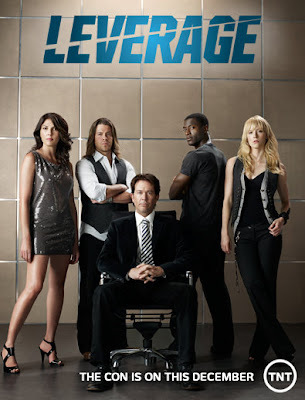 John, I don't know if you'd be interested in this, but I noticed that Leverage appears to have made its way to the BitTorrent file sharing sites. Hey Jon, KidCthulhu and I are cable-tv-free. You know if Leverage is going to be available on iTunes? I consider everybody ought to glance at this. This won't really work, I believe so.